For many people, staying fit and healthy is a real challenge and often requires a combination of specialist help, advice and access to resources, to make those essential healthy living choices. Iris Management, the business venture of health and wellbeing entrepreneur, Phanice Shamalla, is working hard to change mindsets and make it easier for people to think and live healthier lives. LoA was fascinated to talk to Phanice this month to find out more about this health and wellness business concept. Iris Management is committed to promoting a healthier community by building partnerships with health care providers, businesses, and non-profit organizations in order to motivate consumers to take actions and make healthier living choices through the annual trade expo - The Health Festival - and the Iris Health & Wellness Information website. The Health Festival offers a myriad of exhibits, activities, and demonstrations that entertain, engage, and empower the families of Nairobi and surrounding areas. The Health Festival also creates a platform for companies, groups and individuals whose core interest is to promote Health and Wellness products and/or services to network and establish beneficial links. The Health Festival features the following activities - Medical Screenings; Healthy lifestyle demonstrations; Fitness demonstrations; and Health Seminars. The Iris Health & Wellness Information website serves as an information channel to consumers on health, wellness, fitness, sports, nutrition, among others. Our business is based on two basic facts. Firstly, healthy individuals are more productive; and secondly, it costs less to prevent injuries or illnesses than to treat them. In Kenya, 1.7 million households report an illness every four weeks. Additionally, approximately six million adult Kenyans with diabetes and hypertension need follow-up care every four weeks. Yet, access to information on where, when and how to seek quality care, diagnostics and medicines is a challenge for households in Kenya and in Africa as a whole. We believe that traditional approaches to the current health care crisis are misdirected. These traditional efforts are what we call reactive - that is, they wait until after the individual has been stricken with illness or injury, and then pay for the necessary treatments. Our information website will emphasize prevention and good health promotion as a much more proactive approach. By helping families in the community change their behavior patterns and choose more healthy lifestyles, we hope to lower health care expenditures, while raising productivity. 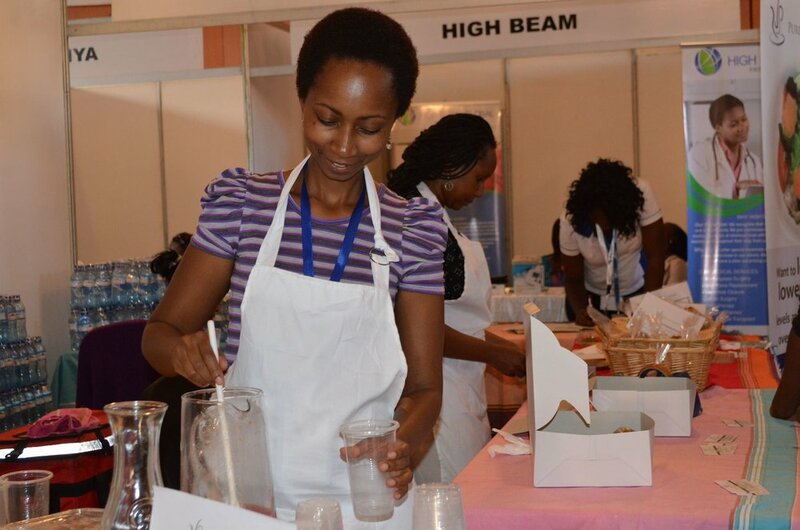 "The Health Festival offers a myriad of exhibits, activities, and demonstrations that entertain, engage, and empower the families of Nairobi and surrounding areas." I worked with professional medical associations soon after college and when I started my business. I organized their annual scientific conferences and monthly seminars. I also organized surgical and medical camps. I became fascinated with how much time and costs can be saved with information on health and wellness. I read papers on children dying of choking because nobody knew first aid; or children dying as a result of falling from high rise buildings; and how many people don’t go for early screening of cancer; and I became fascinated. I made it a goal to have an event that informs and empowers the healthcare consumer in a fun and interactive manner. That is what birthed the Health Festival. Africa’s middle class population is one of the fastest growing in the world, bringing about new stress levels and lifestyle changes. With this in mind, Kenya’s demand for wellness, fitness, health and sports services is growing at an unprecedented rate. It is estimated that if communities adopted the health principles, such as those promoted at the Health Festival, the mortality rates for cancer and cardiovascular diseases, for instance, could drop by 60-70% and 70-80% respectively. Longevity could be increased by 6-12 years, with better quality of life. Medical costs would be greatly reduced and people could live better, healthier lives! Most health systems face budget restrictions in the area of preventive medicine, due to the high priority of curative services, to meet the needs of those in immediate care. The population of Kenya is approximately 45 million. A third of them live in urban areas. 66 percent of Kenyans are 25-40 years of age which comprises the increasing number of ‘middle-class’ citizens. The importance of good physical fitness and healthy nutrition is at its all-time high. Individuals are growing keen on consumption of low fat, low sugar and functional food products. Organic food products are also gaining popularity. The festival hopes to be the region’s all-encompassing premium health, wellness and lifestyle event experience that will reflect the global move towards health, wellness, longevity, positivity, vitality, environmental awareness and sustainability. We are promoting and encouraging adoption of healthier lifestyles and behaviors. "Our business is based on two basic facts. Firstly, healthy individuals are more productive; and secondly, it costs less to prevent injuries or illnesses than to treat them." I work with most amazing and handsome husband. We hope to grow to a bigger team soon. I was born in Nairobi, Pumwani Hospital, which my mum says was a “good” hospital then - unfortunately, it isn’t now. We moved to Kitale when I was one year old - my mum was a teacher, a history teacher, and my dad worked for Kenya Breweries and remained in Nairobi. I am the last born of four, one brother, and two sisters. I went to Kitale Academy Nursery School and Primary school and then St Brigid’s High School for my high school education. I was in boarding school from the age of nine. I went to Moi University and got a bachelor’s degree in Language and Literary Studies. After college I looked for work, formal employment, for over a year without any success. I finally got a job in 2006 as an events co-ordinator at Kenya Medical Association. I had an eight month contract to organize their annual scientific conference and AGM. I was happy to get the job even though I had never attended a conference before and did not even understand what being paid on commission was! I was supposed to fundraise for the meeting and manage the meeting. I loved the challenge! I began researching on their past meetings, other meetings and got into the groove of things! I loved it! I ended up raising over Ksh 3,000,000 with over 50 exhibitors and 300 participants. We had two government ministers attend the opening and closing ceremony. My record still remains unbroken. I loved it. The negotiation, the creativity, the hard work, and of course thefailures! After my contract ended I realized that although I loved doing the event I did not feel respected. My commission was paid after expenses and sometimes expenses were inflated to ensure I was paid as little as possible. Also I had no income until the next year when I applied for the same job for the next conference. So I left KMA and found my next job as a sales executive at a training company and later an events company, In-Sync Management. I left In-Sync and went to be an editor at Story Moja to work as an editor. I did not enjoy it. My passion was in events, educative events. So I left my well paying editor job and started my own business, Iris Management. "By helping families in the community change their behavior patterns and choose more healthy lifestyles, we hope to lower health care expenditures, while raising productivity." The mission of the Health Festival is to bring preventative and restorative lifelong health solutions to the whole consumer. We bring together product and services providers who believe in providing essentials for a healthy body, both on the inside and the outside, and allow the consumer to take responsibility for their health. Expand Health Festival into Mombasa, Kisumu and Eldoret by the end of year two. Iris Management plans to expand to an event and wellness center within a year and regionally within four years. "I made it a goal to have an event that informs and empowers the healthcare consumer in a fun and interactive manner." Success. I am most happy when I set goals and achieve them, and of course when lives are positively impacted. Passion is Key! If you don't love it don't do it! Business is like having a baby or marriage, so beautiful yet so many challenges. Therefore if you love it, you won’t give up!